Since I am ahead of schedule on the Christmas tree quilt, I took the time to finish a Wedding Quilt gift I was already behind on. I have a few treasured quilts set aside for those special events that you would like to give as gifts. I made the quilt but just not at that moment. It's like buying an excess of Birthday Cards and picking out a special one for a birthday. So, I wanted to add special labels to the quilt. 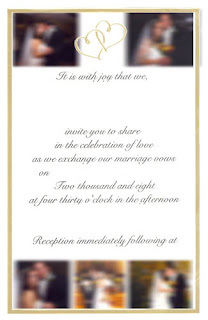 After much thought, I decided to scan their wedding invitation and made a center label out of it after I added some photos. I used Photoshop Elements 5 to create the custom labels. 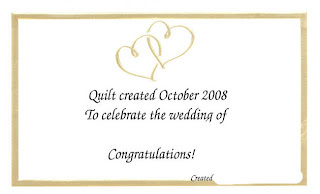 I also used the base design of the invitation and created my own "made by" quilt label. I know you won't be able to see specifics on photos below because I have blurred their details and photos for their privacy. I don't know if they would like their photos/info published so better safe. But, I think this gives you an idea. Then I added fusible webbing to the full labels and adhered them to the "friendship block" quilt I decided will be the special wedding quilt gift. From there, I sewed down the edges of the labels and the quilt will be on it's way today! If you would like any specific details, feel free to contact me. Beautiful quilt. I love the label. I have a new Janome 6600 and am going to make labels for my few quilts that I have as I am a fairly new quilter. great blog too. Love the music. I haven't been able to do that as yet, but love making my blog better and better. 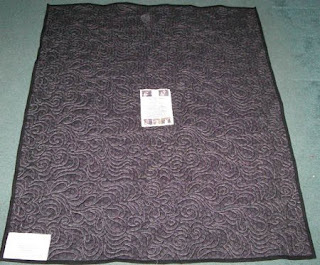 I dont suppose you could say where you found the block pattern for the quilt, I would love to try it. 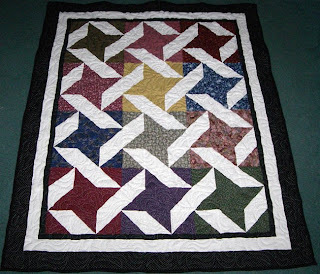 The quilt is made up of the friendship star block. Here are some great online instructions. http://home.howstuffworks.com/friendship-quilt-pattern.htm It can be made up from your left over fabric pieces and one solid color for the bar outlines. I used white. By using white where the instructions above use the white in the last photo on the page, you’ll come out the same. The only difference on mine is the block on the center of each star is the same color as the rest of the non-white fabric. Hope this helps and thank you again!